Thinking about investing in a piece of Austin, but unwilling to budge when it comes to living in prime locations with exceptional walkability? 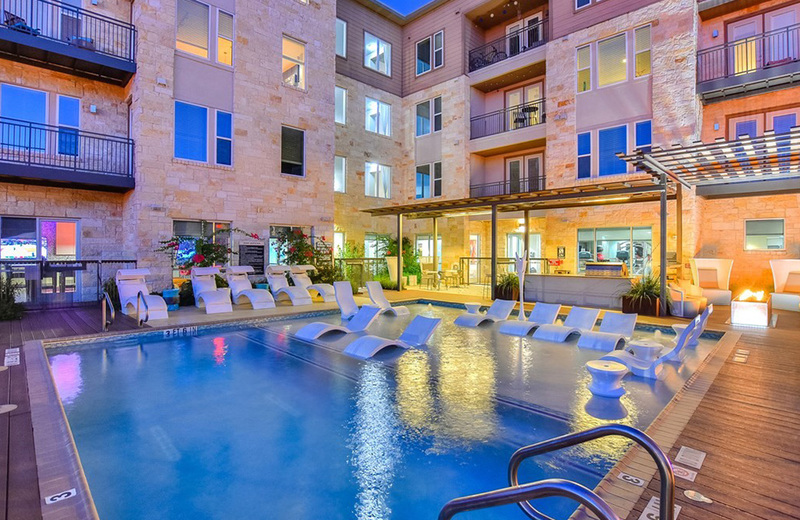 Well you're in luck, because we've assembled the 13 most important emerging condo communities in Austin's urban core in this easy-to-reference list. Flashback to your middle school days. Everything is daunting, everybody is awkward, and if you’re like the author of this post, you just face-planted attempting a sick grind on the staircase railing in your SOAP shoes. Better luck next time, kid. 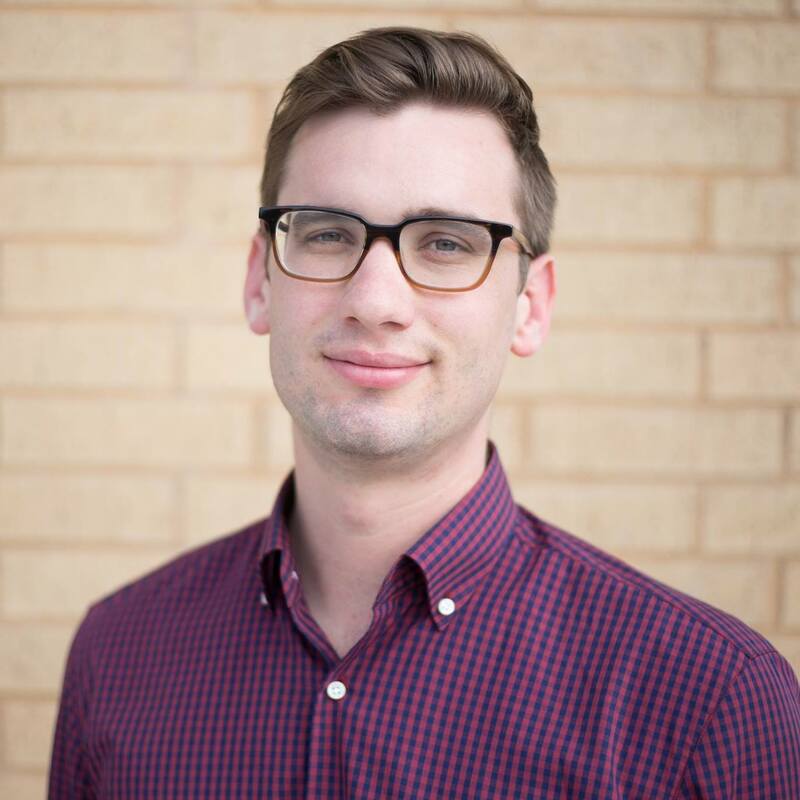 Buying a condo in Austin is like approaching the hottest girl at the middle school dance: everyone wants a piece of our town, but when it comes to making the leap to homeownership, your stomach starts to get queasy. While we at Austin Craft Realty don’t have access to a DeLorean time machine (it’s in the shop) to help your middle school confidence game, we DO have the tools, expertise, and info to empower your knowledge of Austin’s emerging condo market...in places you’ll actually want to live. There are some beautiful things to owning a condominium. Condos maximize your location options, enable a hassle-free “lock & leave” lifestyle, and up the social ante by giving you access to amenities such as a pool, fitness center, clubhouse, parking garage, dog park, and more. And then there are the dreaded HOA monthly payments. While there’s a whole ‘nother conversation that we’re happy to have that justifies HOAs and explains where the money goes to, you’re here to learn about the newest market offerings, not boring things like HOA dues! So, let’s get crackin’. ***Note: Prices are of mid-November 2018. They are slated to go up, as when buildings sell more and more units they tend to raise prices. Give Austin Craft Realty a call for the latest prices. Okay, so we’re crushing on this community HARD right now. Where else are you going to get a 2 bedroom townhouse in the Cherrywood neighborhood on the Eastside WITH A 2-CAR GARAGE starting in the lower mid-$300s?! If you see it elsewhere, let us know. Seriously an incredible value. The walkability of E. Manor is still strong with this location, even though it’s down as far as you want to go, which is approaching Airport Blvd (though far enough away to avoid related noise/traffic). Walkable Hotspots: Thunderbird Coffee, 8Track, Vortex Theater, Dai Due, Salty Sow, Boggy Creek Greenbelt. Reservation Process: $1K refundable reservation. Hold up to 2 weeks. 10% earnest money required once they’ve gone to contract, which should be by mid-December 2018. Location is off the charts at Fourth &. With its confusingly postmodern name and proclivity for “micro-unit” studio living, this Austin condo community will cost you a lil more per square foot due to its centrality. However, who needs space when you’re out and about all the time with the bazillion walkable options, especially when the adjacent Plaza Saltillo is finished. Plenty of retail space at your feet, so it’s always a-buzzin’. Oh, and you get your OWN PERSONAL SOLAR PANEL, which YOU own, not the HOA. Sweet. Check out this awesome video that our very own agent, Zach Sanchez, made under his videography company, Vertical Ground Productions. 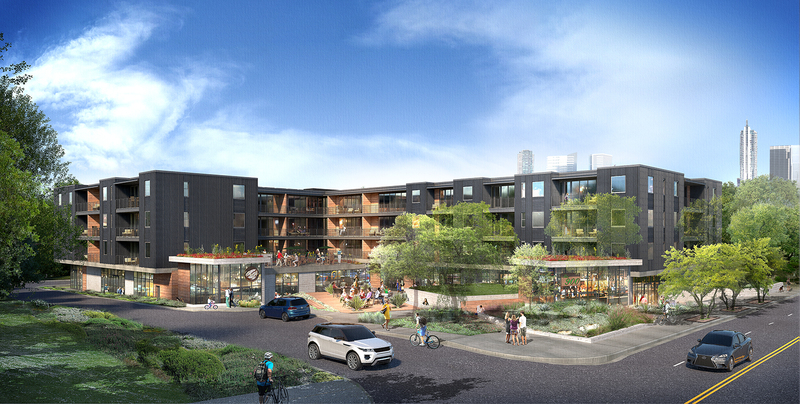 Modern 2-level townhomes perched atop retail overlooking bustling E. 7th street. While E. 7th still has a ways to go in terms of development—and can be a bit noisy/unsightly in spots—you’re still a short walk away from all the action on E. 6th st. These are great homes for those who want the space of two stories but still value walkability. The developer, PSW, has been crushing it in Austin lately and produces a clean, modern product that maximizes light, airy spaces. Here's another community vid from Vertical Ground Productions! With large floorplans and an insanely walkable location at the beginning of Manor rd, Eastgate is selling quickly. In fact, one of our own Austin Craft Realty agents has one reserved! E. Manor rd has been ahead of the development curve of the Eastside for some time now, largely due to its proximity to UT and better schools that the 78722 zip code that encompasses Cherrywood are afforded. 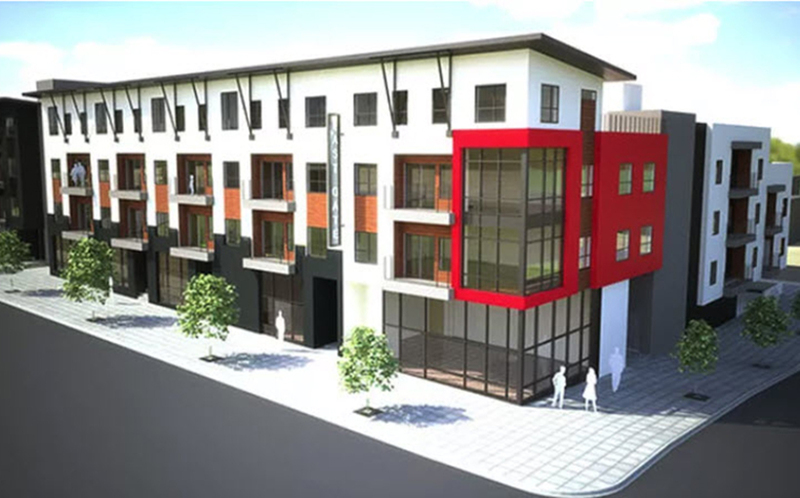 A small project with stunning design that recently broke ground right next to Plaza Saltillo. Much of the project is dedicated to office space, and a giant WeWork is going in just a few blocks away to help fill up all these condos. Foundry only has 1/1s left, and they are likely to go fast. 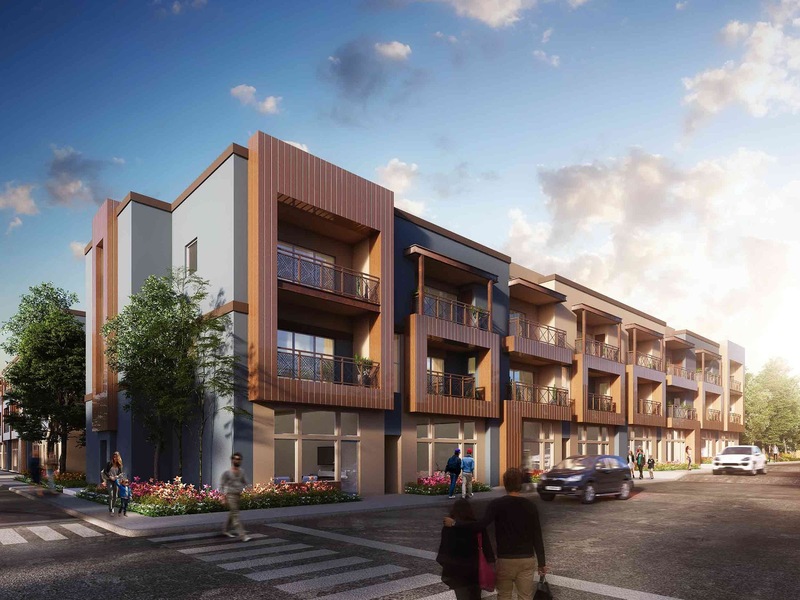 A great investment due to the fact that Plaza Saltillo’s 850 residential housing units will all be centrally-managed apartments for rent, so there will be demand for condos to own! The crème de la crème in boujee downtown living. Being apart of the 1% never felt so good. The interior finishes are completely over the top. Want a herringbone floor pattern? You got it. Want a type of marble that we can’t pronounce? Done. Want your OWN PRIVATE PLUNGE POOL on your balcony?!? That’ll be a crisp $500 G’s, please. When you’re this rich, living in a condo atop a hotel is a great way to flaunt your winnings, but can also be annoying if you just want some peace & quiet. Being a 1%er is sooo hard. Our only gripe is the views…this stunning building is wedged between quite a few shiny new towers, so unless you’re facing west or Southwest then we hope you like an “urban” view. Amenities: Residency atop a hotel accommodates all manner of moods: owners-only library/lounge, multiple bar and culinary experiences, hotel beauty, fitness and spa center. 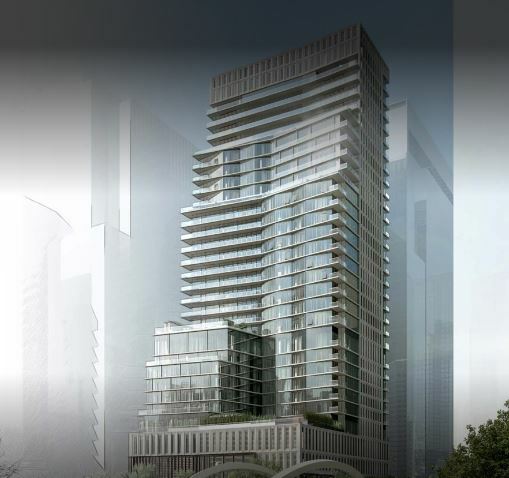 The next pricing tier down is the Michael Hsu-designed 5th & West. But make no mistake, it’s still for the elite 2%, which sounds less daunting. We love the Asia meets southern living interior design aesthetic. We also love the views here, which are protected by Austin’s Capitol View Corridor height restrictions that mandate the Lamar bridge must have a view of the epic Texas Capitol. West 6th is at your feet, as is the Whole Foods HQ, so there’s always something to do. Beautiful, masculine black building with stunning views…if you’re living on a certain side of the hall. Otherwise, it’s a commanding view of the Interstate. 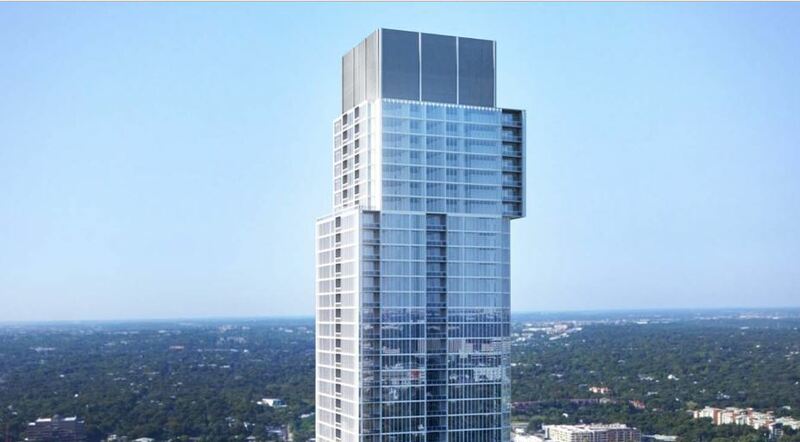 This ultra high-end building is on Austin’s now-infamous Rainey St, which is a boozy peninsula of nightlife sequestered off in to the Southeastern corner of Downtown. While having the gorgeous Town Lake Trail at your feet is nice, this can be a tough place to live on unless you’re all about partying all the time. Amenities: 72’ Infinity-edge pool with expansive decking and cabanas, 2200 SF fitness facility, men and women’s locker rooms with dry-heat sauna and showers, therapeutic dipping pool (hot tub), dog park, urban gardens, (2) fire-pits, clubhouse and lounge, gaming area, yoga terrace, outdoor kitchen and tv area. Reservation Process: No longer in the reservation process. To secure a unit, 10%-15% earnest money is required at contract with the remaining due at close. Right smack dab in the middle of the more polished western half of Downtown, the “Jenga Tower” highrise is the tallest building in town. 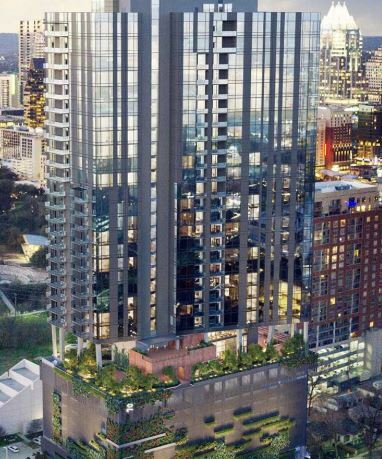 At price points below the rest of Downtown proper’s newest crop of luxury condos, it is already 85% sold. We’ll see how long it takes for a taller tower to best its height! 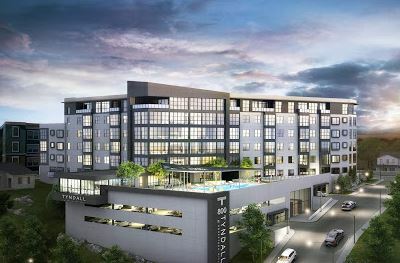 Okay, so while not technically downtown, The Tyndall bills itself as such AND is of a quality that one would expect to be downtown. Fortunately, the the pricing puts it at a great deal if you compare it to its Downtown competition. However, if you compare it to its Eastside competition, you’re looking at a higher price point and HOAs. It’s all how you look at it, but regardless this is a beautiful building with incredible amenities for the Eastside. 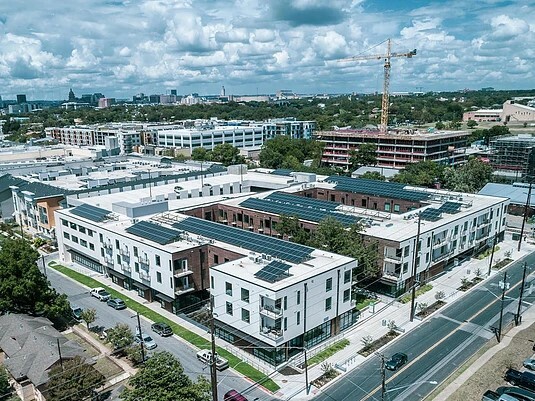 Located on one of Austin’s most charmingly funky streets, South First, Guild Lofts are primarily a collection of 3-story townhomes on a long, skinny tract of land. 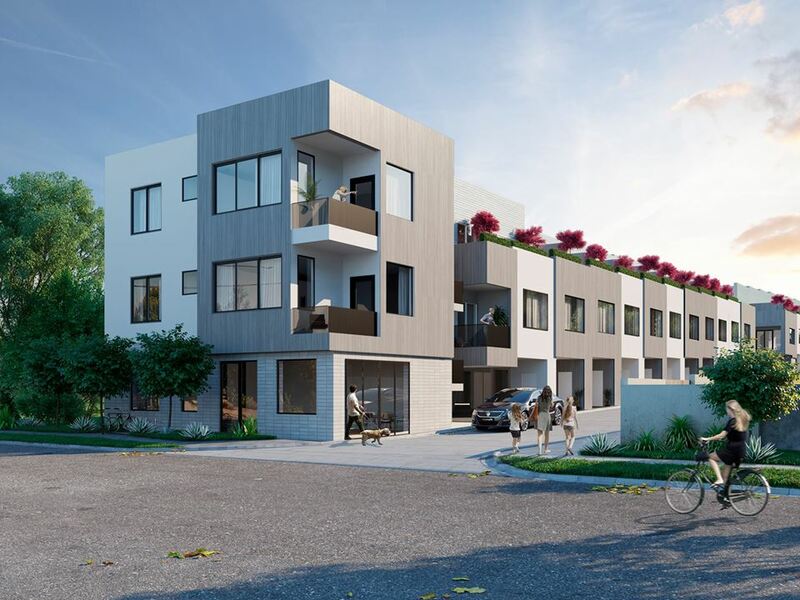 10’ ceilings, covered parking, and impeccable styling by Webber+Studio Architects make this a hot development, especially since finding land for new condos in Austin’s 78704 zip code is becoming more scarce by the day. Being a smidgeon south of Oltorf, essentially the midpoint in S. Central, keeps prices reasonable! Not quite a new building, Zilkr is a unique property because it is an apartment building that is being converted to condos. Location is PRIMO…I mean, it’s only next to the most popular outdoor destination in town, no big deal. 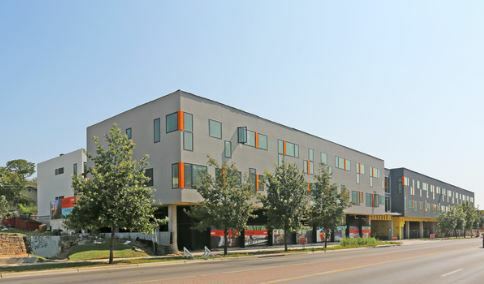 Amenities are solid, and there’s a variety of floor plans, especially studios still available. However, since it was originally built as apartments, the level of finishes and quality of build isn’t up to par vs. the competition on this list. We’re talking wood laminate flooring, electric cooking, and most importantly a wood construction that’ll leave one more liable to noisy neighbors. Sales have been going slowly, so we can always negotiate a deal. If location is your undisputed #1 criterion, these are worth a look! Still a ways out, this excellently located new project by prolific developers PSW is located steps south of the intersection of S. 1st and Barton Springs. Since the site is located across the street from the gorgeous, sprawling campus of the Texas School for the Deaf, the stretch it’s located on is nice and pleasant without tons of traffic. 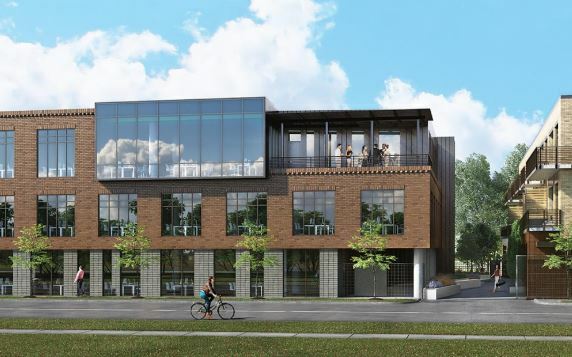 More than just residences, 900 S. 1st will include boutique office spaces, retail, and even a café, which will be located right on the street and act as a cocoon for the residences (condo units AND stand-alone houses) behind them. 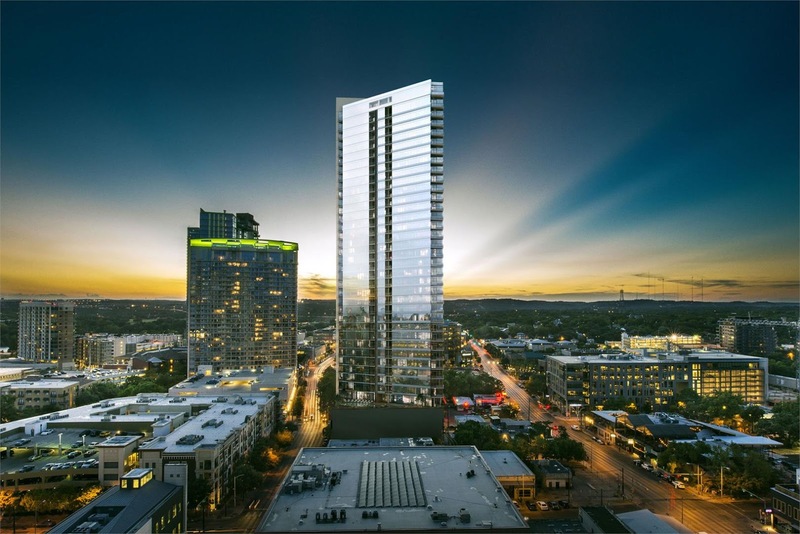 Buying a condo in Austin doesn't have to be daunting. Having the right team of Realtors, lenders, title reps, and insurance experts to handle the transaction will give you more time to focus on living your life instead of pull your hair out wondering if you made the right choice. The coolest thing is that it doesn't cost you a dime to use a Realtor with new condo developers! We advocate for you during the build process to ensure you're being treated fairly. Drop us a line at howdy@austincraftrealty.com or call 512-649-1010 to talk with an expert agent today about emerging condo communities in Austin.